Servicing Stop Ltd, is an innovative car servicing company who specialise in hassle free, convenient and cost effective servicing nationwide. We are all about you, the customer, so we want to help you by sharing our top tips for car safety. According to the office for National Statistics, car theft has been on the decline since 1995. Yet last year 889,000 vehicles were stolen in England and Wales. According to the office for National Statistics, car theft has been on the decline since 1995. Yet last year 889,000 vehicles were stolen in England and Wales. Servicing Stop is now here to help you from being a statistic by keeping your prized vehicle safe. 1. Make sure your door is locked. Seems obvious, but do check. Sometimes in a rush we may think we have locked our car doors but in actual fact we haven’t. Most cars now will either make a sound or flash indicator lights, or both. Either way, check, and then check again. 2. Don’t leave your valuables in sight. Again, it seems obvious but even just an old jacket on the back seats could entice a thief to prowl. Take your valuables with you. The London Metropolitan Police’s ‘safer neighbourhood’ scheme goes as far to recommend that owners leave the glove box open, if nothing is in it of course. 3. Park in a safe area. Park on streets with lights on, busy streets or even pay to park in a secure car park. Thieves will always be deterred from stealing your precious car when the risks are much higher. Plus, if you have a garage, then use it. 4. Keep your keys safe. Simple again, but if a thief can get hold of your keys then they have your car. Plus, the theft of your keys makes for an extremely quick and believable getaway. 5. Technology- Do’s and Do Not’s. Do invest in some anti-theft technology. Steering-Wheel locks, hood locks, gear shift locks and immobilisers (unless your car already has one) are all examples of anti-theft deterrents. Do Not leave any technology in your car or, any traces that there have been any in there. If thieves see wires sticking out of glove boxes or out of the cigarette lighting port then they will be more curious of what else they could find. Do Not leave the residue of your Sat-Nav on your front windscreen. Cleaning your window every time you use your Sat-Nav might be a bit of an arduous task but do it; thieves look for the mark left by the sucker. 6. Keep an eye on your number plates. This may seem a bit far-fetched to some but honestly, keep an eye out. Vehicle cloning is on the rise and your number plates are valuable to those who wish to steal your cars identity. So if your plates disappear overnight, contact the police and the DVLA as soon as possible. 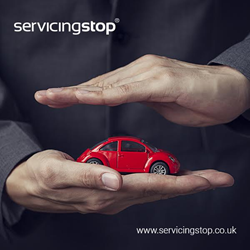 About Servicing Stop Ltd.: Servicing Stop Ltd. was founded by Oliver and Toby Richmond to give the UK an enhanced professional car service experience with emphasis on customer service and cost. The company gained popularity in 2009 by appearing on BBC's Dragons' Den show and getting offers from three of the famous Dragons. The company has 1500+ garages nationwide and is continuing to rapidly grow.